A study partly funded by Google and conducted by University of Cambridge researchers found that a whopping 87 percent of Android devices are vulnerable to known flaws. According to a post by Alastair R. Beresford, one of the team members, it's because a lot of manufacturers don't issue security patches regularly, leaving their devices exposed to malware. The researchers got that percentage from the 20,000 users who've installed their Device Analyzer app and ran it in the background. 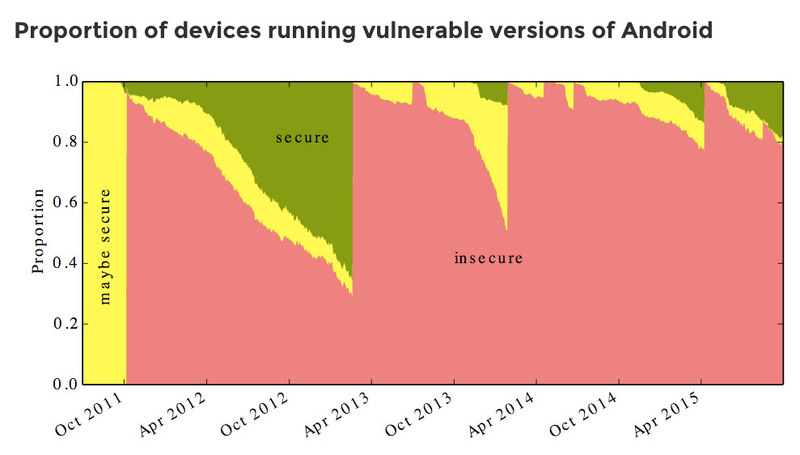 Thanks to the data the app gathered, they were able to score manufacturers based on the number of their phones/tablets free from critical vulnerabilities, the proportion of their hardware updated to the latest version of the platform, and the number of devices still waiting for security patches. Google's Nexus devices got 5.2 out of 10, making them the safest out of all Android handsets available. LG comes in second place with a score of 4.0, while Motorola got a decent 3.1. Other popular Android manufacturers (Samsung, Sony, HTC and Asus) come after Motorola, all with 2.x scores. Beresford says the team hopes that "by quantifying the problem [they] can help people when choosing a device" and, in turn, "provide an incentive for other manufacturers and operators to deliver updates." The researchers are still looking for new test subjects willing to install the Device Analyzer app from Google Play. We assume that means they'll update their scores and stats in the future -- for now, you can see how manufacturers did on the team's Android Vulnerabilities website.